A hidden epidemic is poisoning America. The toxins are in the air we breathe and the water we drink, in the walls of our homes and the furniture within them. We can’t escape it in our cars. It’s in cities and suburbs. It afflicts rich and poor, young and old. And there’s a reason why you’ve never read about it in the newspaper or seen a report on the nightly news: it has no name — and no antidote. Today, we are all unwitting subjects in the largest set of drug trials ever. Without our knowledge or consent, we are testing thousands of suspected toxic chemicals and compounds, as well as new substances whose safety is largely unproven and whose effects on human beings are all but unknown. The Centers for Disease Control (CDC) itself has begun monitoring our bodies for 151 potentially dangerous chemicals, detailing the variety of pollutants we store in our bones, muscle, blood, and fat. None of the companies introducing these new chemicals has even bothered to tell us we’re part of their experiment. None of them has asked us to sign consent forms or explained that they have little idea what the long-term side effects of the chemicals they’ve put in our environment — and so our bodies — could be. Nor do they have any clue as to what the synergistic effects of combining so many novel chemicals inside a human body in unknown quantities might produce. The story of how Americans became unwitting test subjects began more than a century ago. The key figure was Alice Hamilton, the “mother” of American occupational medicine, who began documenting the way workers in lead paint pigment factories, battery plants, and lead mines were suffering terrible palsies, tremors, convulsions, and deaths after being exposed to lead dust that floated in the air, coating their workbenches and clothes. Instead of leveling with the public, the lead industry through its trade group, the Lead Industries Association, began a six-decade-long campaign to cover-up its product’s dire effects. It challenged doctors who reported lead-poisoned children to health departments, distracted the public through advertisements that claimed lead was “safe” to use, and fought regulation of the industry by local government, all in the service of profiting from putting a poison in paint, gasoline, plumbing fixtures, and even toys, baseballs, and fishing gear. As Joe Camel would be for tobacco, so the little Dutch Boy of the National Lead Company became an iconic marketing tool for Dutch Boy Lead Paint, priming Americans to invite a dangerous product into their children’s playrooms, nurseries, and lives. The company also launched a huge advertising campaign that linked lead to health, rather than danger. It even produced coloring books for children, encouraging them to paint their rooms and furniture using lead-based paint. The CDC estimates that in at least 4 million households in the U.S. today children are still exposed to dangerous amounts of lead from old paint that produces dust every time a nail is driven into a wall to hang a picture, a new electric socket is installed, or a family renovates its kitchen. It estimates that more than 500,000 children ages one to five have “elevated” levels of lead in their blood. (No level is considered safe for children.) Studies have linked lost IQ points, attention deficit disorders, behavioral problems, dyslexia, and even possibly high incarceration rates to tiny amounts of lead in children’s bodies. Unfortunately, when it came to the creation of America’s chemical soup, the lead industry was hardly alone. Asbestos is another classic example of an industrial toxin that found its way into people’s homes and bodies. For decades, insulation workers, brake mechanics, construction workers, and a host of others in hundreds of trades fell victim to the disabling and deadly lung diseases of asbestosis or to lung cancer and the fatal cancer called mesothelioma when they breathed in dust produced during the installation of boilers, the insulation of pipes, the fixing of cars that used asbestos brake linings, or the spraying of asbestos on girders. Once again, the industry knew its product’s dangers early and worked assiduously to cover them up. Today, however, these devastating industrial-turned-domestic toxins, which destroyed the health and sometimes took the lives of hundreds of thousands, seem almost quaint when compared to the brew of potential or actual toxins we’re regularly ingesting in the air we breathe, the water we drink, and the food we eat. Of special concern are a variety of chlorinated hydrocarbons, including DDT and other pesticides that were once spread freely nationwide, and despite being banned decades ago, have accumulated in the bones, brains, and fatty tissue of virtually all of us. Their close chemical carcinogenic cousins, polychlorinated biphenyls (PCBs), were found in innumerable household and consumer products — like carbonless copy paper, adhesives, paints, and electrical equipment – from the 1950s through the 1970s. We’re still paying the price for that industrial binge today, as these odorless, tasteless compounds have become permanent pollutants in the natural environment and, as a result, in all of us. What’s inside your new walls might be even more dangerous. While the flame retardants commonly used in sofas, chairs, carpets, love seats, curtains, baby products, and even TVs, sounded like a good idea when widely introduced in the 1970s, they turn out to pose hidden dangers that we’re only now beginning to grasp. Researchers have, for instance, linked one of the most common flame retardants, polybrominated diphenyl ethers, to a wide variety of potentially undesirable health effects including thyroid disruption, memory and learning problems, delayed mental and physical development, lower IQ, and the early onset of puberty. These synthetic materials are just a few of the thousands now firmly embedded in our lives and our bodies. Most have been deployed in our world and put in our air, water, homes, and fields without being studied at all for potential health risks, nor has much attention been given to how they interact in the environments in which we live, let alone our bodies. The groups that produce these miracle substances — like the petrochemical, plastics, and rubber industries, including major companies like Exxon, Dow, and Monsanto — argue that, until we can definitively prove the chemical products slowly leaching into our bodies are dangerous, we have no “right,” and they have no obligation, to remove them from our homes and workplaces. The idea that they should prove their products safe before exposing the entire population to them seems to be a foreign concept. A toxic dump used to be a superfund site or a nuclear waste disposal site. Increasingly, however, we — each and every one of us — are toxic dumps and for us there’s no superfund around, no disposal plan in sight. 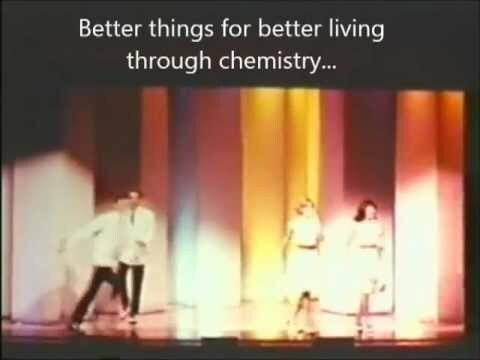 In the meantime, we’re walking, talking biohazards and we don’t even know it. 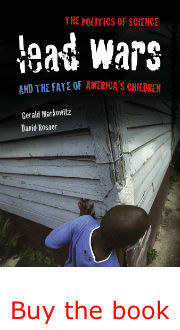 David Rosner and Gerald Markowitz are co-authors and co-editors of seven books and 85 articles on a variety of industrial and occupational hazards, including Deceit and Denial: The Deadly Politics of Industrial Pollution and, most recently, Lead Wars: The Politics of Science and the Fate of America’s Children, (University of California Press/Milbank, 2013). Rosner is a professor of history at Columbia University and co-director of the Center for the History of Public Health at Columbia’s Mailman School of Public Health. Markowitz is a professor of history at John Jay College and the Graduate Center, City University of New York.